I'm gonna give one a try, the DLC version. Will post pics soon. Any feedback on how this runs? Im sure its just as good as the other VS motors. If anything, it makes for a longer lasting motor, cleaning is easier. It's broken in on my EBIS machine but since that I haven't had time to run it. I do have pics which I plan to post eventually; I apologize but I don't have lots of free time. The engine looks great internally. I could tell Rody did some work dishing out the head button, first thing I noticed. The DLC application is only on the weighted side of the crank and crank pin. I would have liked to see it on the clutch bell bearing area as well. Cleaning is easier? What do you mean? The DLC application is only on the weighted side of the crank and crank pin. I would have liked to see it on the clutch bell bearing area as well. Thank you for your comments, I will keep this in consideration for the future. DLC coating makes for less gunk / residue buildup. And as such cleaning is easier. Is the 2135 pipe for bottom end power? Yes, perfect for bottom end power, not too brutal though. I've been running OS based engines for almost a decade on & off (switching between electric & Nitro etc) and with the VZB based engines the V-Spec, Speed, And Ninja I would always add the extra head shim it came with the 1mm, which would keep my engines compression longer since at the about 3-4 gallon mark remove the added shim and it'd keep running with the same speed as when it was new up to 10 gallons easy, I'd usually replace the bearings at the same time. Im debating if this VS B01 the newest version I think, it's the one selling for $40 more than the regular 2101 and it's the Limited Edition DLC version, just making sure you know exactly which engine if I should or can add an extra 1mm shim or will it throw the timing off too much? Also Ill be running 30% Fuel 11% oil to break it in (Changing fuels due to availability), then going to run a different fuel that's Runner Time 33% Nitro. So I'm thinking with the engine being a long stroke, P3 Plug, and high output, the 1mm shouldn't make a huge different and keep the engine running strong and compression longer. Ill tell you what a huge reason I bought a couple of these engines is watching Billy Eastons buggy at the ROAR Warm Up Race. His VS Racing Engine was SCREAMING, in practice I helped him pit a few times and it ran flawlessly, it had so much overall power it was crazy, he could cut corners and hit the larger jumps and make it, he'd pass most guys on the straight and the way it screamed I thought it was running lean or something, but no it came in a consistent 235 each time, had smoke clean coming out fast. He had easily one of the best running engines I saw, I wished at the time I had my Nitro together. I bought one of 2101 engines used but had a different cooling head on it, and when I opened it up and pulled it apart the previous owner had it fully modified and had an OS Speed DLC Crank also modified, 2 added holes drilled into the piston, and I held off running it until I got more information on it. I think the mods were done by AMR Engines because the work looks identical to his stuff on Facebook, very precise and smooth. After talking with the previous owner I found out they only Ran it for a race then sold it so they didn't know much. But I'll tell you what with the stock VS DLC Limited Edition B01, the look of the cuts on the crank, sleeve, etc I know it'll be amazing. There were others at the warm up running the engine, mainly in Truggy with the 2135 or 2050 and they made CRAZY bottom end power, and other buggys that had them I didn't watch like I did Billy's but the Truggys I watched and wow. I'll be running the 2090 and a snappy clutch. Concerning the VSB01 engine and if you are running 30% nitro it would indeed good to add an extra shim of 0.1mm since the engines are set for 25% nitro in general. With great joy I can present you our new VSB02 buggy engine. Same exclusif design crankshaft by Rody Roem but with DLC treatment all over the shaft. New exclusif 5-port sleeve designed by Rody Roem. Extra workings inside the crankcase. The main-feature of this new engine is its unique and specific 5-port design which will give the engine a faster climbing in rpm but still keeping its easy driving. This in combination with the already well balanced bi-turbo crankshaft you will find the best in power and fuel-consumption. We have done our best to maintain the price on the same level as the B01 engine and hope this will allow you to push better the sales. stephen_bess, NitroVein, Pedro Jesus and 1 others like this. Hi Rody, happy to hear of the V B02. My B01 has proven to be a incredibly powerful engine that is one of the fastest I've owned. Many people have stopped me at the track to ask "what is that?" and then say it's the fastest engine they've ever seen. And nice to see the B02 with a full DLC crank! Should I take credit for requesting that?? Haha. Yes, you can take a little credit for this...:-), but you we not the only one suggesting since we make these engines in collaboration with OS. 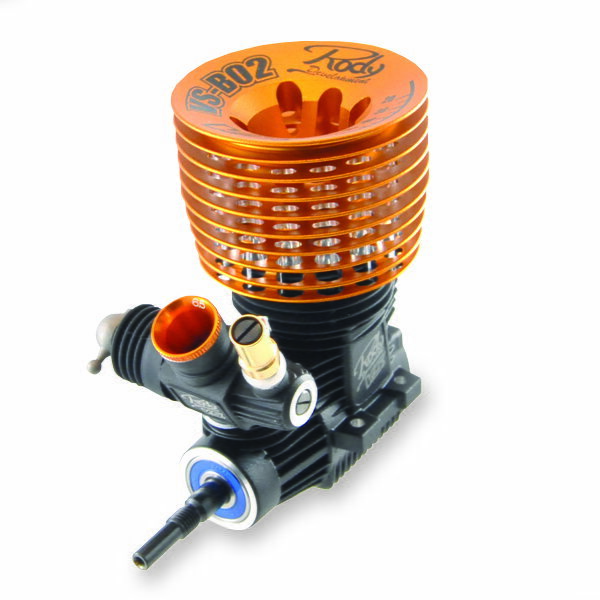 I have also send a VSB02 engine to Billy Easton and hope he has received it in time for the Buggy nats this coming weekend.